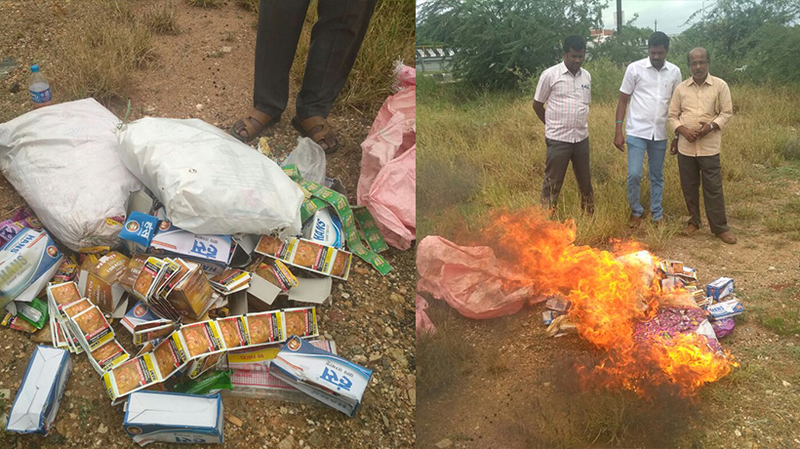 Coimbatore: Food safety department officials seized tobacco products worth Rs 10,000 from Krishna Stores near Karumathampatti in the city on Wednesday. People’s organisation ‘Aneethikku Ethirana Makkal Iyakkam’, on receiving information about the sale of banned tobacco products, complained the food safety department in Sulur. Senior official Sakthivel searched the store and found banned gutka products worth Rs 10,000. He said most of the petty shops in the city were involved in selling the products. “We are doing our best to control the sale of banned tobacco products. Seized products are destroyed in city outskirts,” he added. Food safety office issued a warning notice to shop owner Deepak, said organisation activist D Prabakaran. He wanted the Government to take appropriate action.